The original Apple Computer, also known retroactively as the Apple I, or Apple-1, is a personal computer released by the Apple Computer Company (now Apple Inc.) in 1976. They were designed and hand-built by Steve Wozniak. Wozniak’s friend Steve Jobs had the idea of selling the computer. The Apple I was Apple’s first product, and to finance its creation, Jobs sold his only means of transportation, a VW van and Wozniak sold his HP-65 calculator for $500. It was demonstrated in July 1976 at the Homebrew Computer Club in Palo Alto, California. The Apple I went on sale in July 1976 at a price of US$666.66, because Wozniak “liked repeating digits” and because they originally sold it to a local shop for $500 plus a one-third markup. About 200 units were produced. Unlike other hobbyist computers of its day, which were sold as kits, the Apple I was a fully assembled circuit board containing about 60+ chips. However, to make a working computer, users still had to add a case, power supply transformers, power switch, ASCII keyboard, and composite video display. An optional board providing a cassette interface for storage was later released at a cost of $75. The Apple I’s built-in computer terminal circuitry was distinctive. All one needed was a keyboard and an inexpensive television set. Competing machines such as the Altair 8800 generally were programmed with front-mounted toggle switches and used indicator lights (red LEDs, most commonly) for output, and had to be extended with separate hardware to allow connection to a computer terminal or a teletypewriter machine. This made the Apple I an innovative machine for its day. In April 1977 the price was dropped to $475. It continued to be sold through August 1977, despite the introduction of the Apple II in April 1977, which began shipping in June of that year. 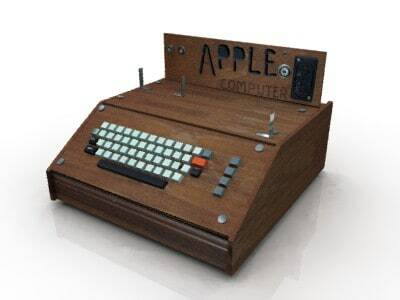 Apple dropped the Apple I from its price list by October 1977, officially discontinuing it. As Wozniak was the only person who could answer most customer support questions about the computer, the company offered Apple I owners discounts and trade-ins for Apple IIs to persuade them to return their computers, contributing to their scarcity. In 1976, Concord High School Junior Wai Lee assembled one of the first 12 Apple Is (no serial number), the first Apple Computer in an aluminum housing. As of 2012, less than 50 Apple I computers (with only six in working order) are believed to exist, making it a very rare collector’s item. An Apple I reportedly sold for $50,000 USD at auction in 1999. A unit was sold in September 2009 for $17,000 on eBay. A unit was sold on March 23, 2010 for $42,766 on eBay. In November 2010, an Apple I with serial number 82 sold for £133,250 ($210,000) at Christie’s auction house in London. The high price was likely due to the rare documents and packaging offered in the sale in addition to the computer, including the original packaging (with the return label showing Steve Jobs’ parents’ address, the original Apple Computer Inc ‘headquarters’ being their garage), a personally typed and signed letter from Jobs (answering technical questions about the computer), and the original invoice showing ‘Steven’ as the salesman. The computer was brought to Polytechnic University of Turin where it was fixed and used to run the BASIC programming language. On June 15 2012, a working Apple I was sold at auction by Sotheby’s for a record $374,500, more than double the expected price. In October 2012, another (very early – Serial number 22) Apple I in a Christie´s auction found no bidder who was willing to pay the starting price of 80.000 GBP. An unknown bidder from Asia spent almost halb a million Euro for this Apple 1 in full working condition. On 25th May 2013 this marvelous piece of computer history came under the hammer at Auction Team Breker in Germany. The auction house based in Cologne got 516,461 Euro ($ 671,400).